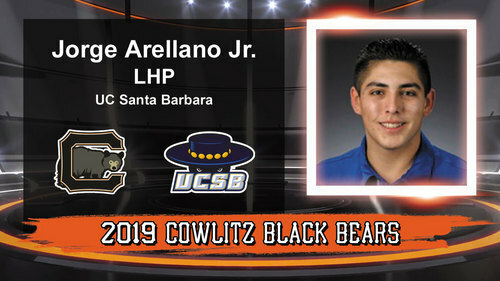 The Cowlitz Black Bears are happy to announce the signing of UC Santa Barbara pitcher Jorge Arellano Jr.
Arellano is highly recruited left-handed lightning arm from Downey High School in Los Angeles, California. Last year, he was included on Perfect Game's list of Top College Freshman for the 2018 season. He was also drafted in the 36th round by the Cleveland Indians in the 2017 MLB Draft. Arellano is off to a great start for the Gauchos. He has a 1.08 ERA with eight strikeouts in four appearances so far. “We have added another very good arm to our staff for the summer,” said Cowlitz Head Coach Grady Tweit. Please welcome Cudahy, California’s own, Jorge Arellano Jr. to the 2019 Black Bears!